With outdoor photography, it is inevitable that we get caught in the rain. I always enjoy those moments, because it adds a different “feeling” to my photographs. The weather greatly influences the final photograph. 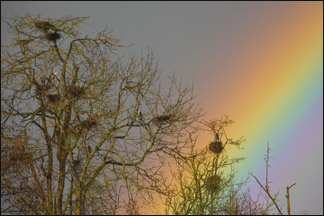 This one of the Great Blue Heron rookery was taken in March, during a rain shower. The sun behind me created the rainbow behind the rookery. Without the rain or the sun, this would have been a very different image. It would have had a flat sky, with little color. Rain can be damaging to camera equipment. It is good to shelter the camera from the rain, though remember that most cameras are water-resistant. All equipment should be dried off, if it gets rained on. A chamois cloth works well, dries quickly and fits into a camera bag pocket. Drying of the camera and lens keeps the it working well. Also, it’s important to protect the camera and lens being used in the inclement weather. There are several ways to do this. If the camera is mounted on a tripod, an umbrella can be held over the equipment to protect it from the rain. When carrying the camera, a shower cap can work as protection. Currently, a clear plastic sleeve can be purchased at a camera store. It fits over the camera and lens, and allows the photographer to slid their hands in the sides to operate the camera. One of the most important pieces of equipment, in wet weather, is the camera bag. It is important to have a bag that is water proof, or at least water-resistant. Many bags, such as backpacks by Tamerc, have waterproof zippers, and fabric that covers the them. They are built to be in wet weather, without compromising the camera equipment inside. Also, these bags are well padded to protect equipment from damage. Many other manufacture’s have good, protective camera bags too. ← What’s in a Digital Darkroom? Fantastic post, very informative. I ponder why the opposite experts of this sector do not understand this. You must proceed your writing. I am sure, you’ve a great readers’ base already!|What’s Happening i am new to this, I stumbled upon this I have discovered It absolutely helpful and it has aided me out loads. I’m hoping to give a contribution & aid other users like its aided me. Good job. Just desire to say your article is as amazing. The clearness on your put up is just great and that i can think you are a professional on this subject. Fine together with your permission allow me to grasp your RSS feed to keep up to date with approaching post. Thank you a million and please continue the gratifying work. Very nice post. I simply stumbled upon your weblog and wished to say that I have really loved surfing around your blog posts. In any case I will be subscribing for your feed and I hope you write once more very soon!